The Professional Ambulance Association of Wisconsin (PAAW) selected Chief Deonne Eske of Ashippun Fire Department for the state’s 2016 nomination as an American Ambulance Association Star of Life. She shows exemplary commitment to supporting her local EMS and community members, as well as to working collaboratively with four transporting ambulance services in her region. Over the past thirty-two years, Chief Eske has progressed from volunteer EMT/ firefighter to lieutenant, captain, and now chief of the department. In 2014, she attended 100% of all fire and EMS meetings and over 90% of fire and rescue calls as a volunteer. Ashippun has an elderly housing complex with 12 units. During a power outage, Chief Eske took it upon herself to check on the residents. She arranged an oxygen tank for a patient dependent on an oxygen concentrator, then returned every four hours round-the-clock to change the tank and ensure the residents’ wellbeing. She bought them all dinner at her own expense. In addition, Chief Eske presents an annual fire safety program to the elderly, including how to call 911 and how to prepare for an ambulance’s arrival. Chief Eske follows up on patients who were recently transported by ambulance and goes above and beyond, even cleaning and changing bed sheets before they come back home. The duties and responsibilities performed by Chief Eske contribute to the quality of life for citizens of and visitors to Wisconsin, through the delivery of high-quality emergency medical care and treatment of the sick or injured. 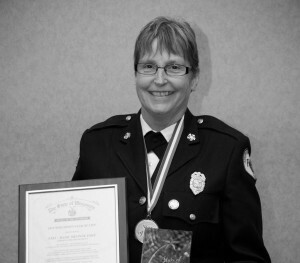 The Professional Ambulance Association of Wisconsin is proud to present Fire Chief Deonne Eske for this high honor and recognition as an American Ambulance Association Star of Life.